The State Water Efficiency and Enhancement Program (SWEEP) provides financial assistance to growers for on-farm irrigation system improvements that both reduce GHG emissions and save water. It is administered by the California Department of Food and Agriculture (CDFA). Find additional resources, including a CalCAN fact sheet on the program and more information from the CDFA. In 2014, under an emergency drought declaration, Governor Brown authorized a new program called the State Water Efficiency and Enhancement Program (SWEEP). Funding for the program has come from the state’s Greenhouse Gas Reduction Fund, raised from cap-and-trade allowance revenue, as well as Propositions 1 and 68. Variable frequency drives to reduce energy use and match pump flow to load requirements. For more information on current grant cycles and application procedures, see the CDFA website. 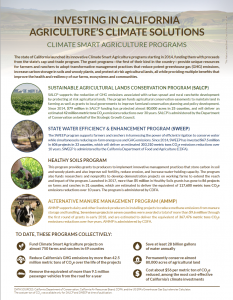 California has launched a suite of Climate Smart Agriculture programs to invest in agricultural climate solutions. This fact sheet series summarizes them and tells some stories about producers participating in them.